Dear Johnnies is another hospital gown meant for a slightly different purpose during labor and delivery. This one you wouldn’t want to get dirty- it’s so pretty with its patterns and colors. It is designed exactly like your standard hospital gown so few hospitals should have a problem with it. But instead of dingy hospital colors and twisted old ties, you’ve got bright happy patterns AND ribbons (love it). Every gown comes in a cute little matching pouch. The gown has arm and back snaps along with ties all the way down the backside for easy medical access, but without revealing all of your goods. 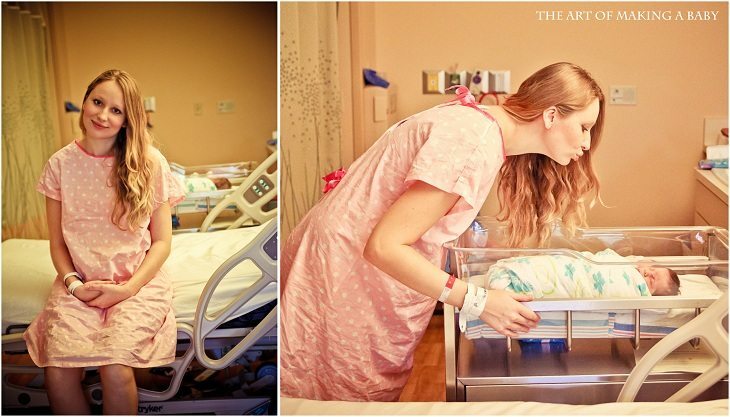 As soon as I was transferred into my postpartum recovery room, I couldn’t wait to change into my cute pink gown. It wasn’t even a matter of not being comfortable in anything else. I just wanted to look and feel pretty after going through a beautiful but, let’s admit it, dirty experience. And then of course it allows for much more pleasant hospital photos. Try to imagine these same shots with a green patterned standard hospital issue gown. Yuck! Not the same! Not the same! WIN IT: You can enter below to win a gown from Wellesley collection! You can also like their FB page and follow their Twitter for news and discounts. Please make sure to visit Dear Johnnies’ Facebook Page and write on their wall which design you’d choose if you won. Maybe not the same, but I do treasure my hospital pics green gown and all. But the polk a dots are very cute. I’d order one for next time, why not.